Film Lab to Host Performance of James Huang's New Feature "Marriage Made in Hell!" 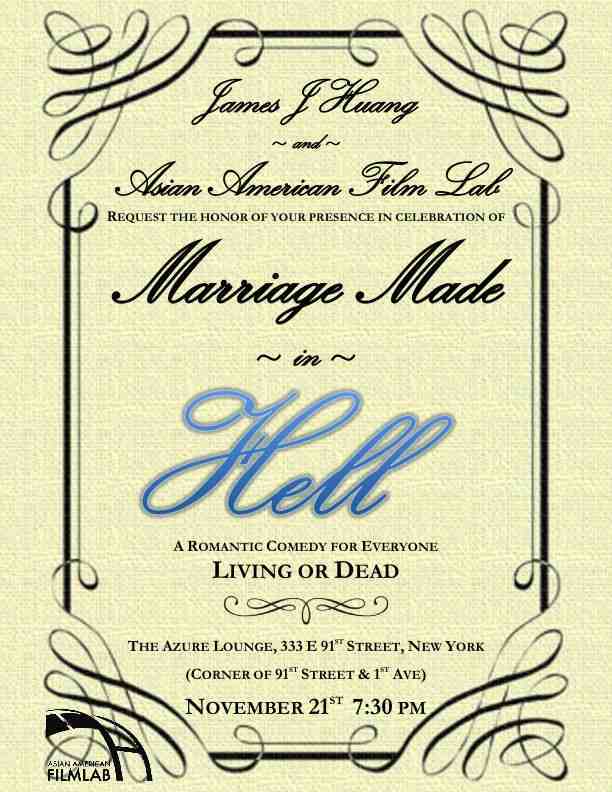 The Asian American Film Lab, a 501c3 not for profit organization dedicated to the promotion of ethnic and gender diversity in film and television, will be hosting "Marriage Made in HELL!" Comedy Screenplay Reading & Workshop on Nov. 21 in NYC! NEW YORK - Oct. 19, 2013 - PRLog -- The Asian American Film Lab (“Film Lab”) is pleased to announce an upcoming performance event featuring a script written by the accolade-winning screenwriter James J. Huang. On November 21st, the Film Lab will be presenting a side-splitting reading of the new romantic comedy, “Marriage Made in Hell,” a supernatural comedy in which a carefree slacker thinks he's found the perfect fake wife to foil his marriage minded mother's plans -- until his bride's spirit comes back from the underworld to prove she's DEAD wrong for him. The screenplay is one of Amazon Studio’s most popular projects, ranking between 16th and 24th out of over 2,000 comedy projects and #2 on their Premise Wars board. The Film Lab's Actor Directory members will be performing the comedy for your enjoyment under the direction of 72 Hour Hour Shootout competitor Eddie Shieh at a reading on November 21 at 7:00pm in Manhattan. Lorna Nowve, the coordinator of the Film Lab's Unfinished Works program will then moderate a constructive Q&A and feedback session which provides the audience with an opportunity to participate in the creative process and interact directly with screenwriter James J. Huang, director Eddie Shieh and the cast members of the reading! Special thanks to TIFFIN wines, who will be providing refreshments for the event, which will be free and open to the public. Donations of $3-5 are suggested to help promote diversity initiatives. Free tickets can be obtained on the Film Lab website: www.asianamericanfilmlab.com. James J. Huang is a New York City born and bred Asian American writer. He strongly believes that writing comedy for mass audiences is one of the best and most effective mediums to promote more balanced portrayals of Asian Americans. His romantic comedy "Marriage Made in Hell" features U.S. born Asian American protagonists and was a semi-finalist at the 2013 Austin Film Festival and honorable mention at the 2013 Asian American International Film Festival. James is a licensed pharmacist currently practicing at Cardon's Children Medical Center in Mesa, Arizona. The Asian American Film Lab (Film Lab) is a 501(c)(3) non-profit dedicated to the promotion and support of gender and ethnic diversity in film and television through free monthly educational and outreach programming and the acclaimed annual 72 Hour Shootout filmmaking competition (asianamericanfilmlab.org). This annual competition has inspired hundreds of filmmakers by helping nascent talent take brave steps towards a filmmaking career. The Film Lab was formed in 1998 by collaborative of New York-based filmmakers whose goals were to hone their craft and to share their knowledge, experience and resources. The membership has grown to comprise professionals, artists and other talented individuals who all share the common goal of creating great film and promoting all filmmakers of color, with a focus on Asian Americans, and the visibility of their stories and characters in film and television. The Film Lab is run under the direction of President Jennifer Betit Yen. The Unfinished Works program is coordinated through Lorna Nowve. Acting and Advisory Board members include Aaron Woolfolk, Eric Lin, Bea Soong, John Woo, Erik Lu, and James Kyson. The Film Lab's Unfinished Works program constitutes its longest running program, ongoing for 15 consecutive years. Unfinished Works allows writers to workshop, in a structured and constructive environment, unfinished plays, screenplays and television scripts. It also serves as a bridge between actors, writers and directors of color, particularly Asian Americans. To submit your screenplay for a free reading and workshop, please email Lorna Nowve at UnfinishedWorks@film-lab.org with your name, email, telephone number, logline, synopsis, and a brief statement of why you feel Unfinished Works will be useful to developing and improving your screenplay. Eddie Shieh is a writer-director, sometimes producer, and a sold screenwriting member of the Writer's Guild of America East and WGA Digital Caucus. Eddie has competed in the Asian American Film lab's famous 72 Hour Shootout filmmaking competition, an annual competition designed to promote ethnic and gender diversity in film, several times. His 2011 short, "Tu & Eu (You & Me)," starring Daniela Ruah (CBS/NCIS:LA) and Ato Essandoh (BBC/Copper, Django Unchained, Garden State), is a 10x Finalist also with wins for Best Direction, Ensemble Cast, and several nominations for Best Actor, Actress, and Music from Academy® Qualifying and international festivals. His recent film, "Mr. Chavan," was a 2013 72 Hour Shootout Finalist, now adapted for upcoming festivals. All his completed works have garnered numerous accolades and been signed to distribution internationally. He has also worked with Pulitzer-Nominated, Richard Vetere, and acclaimed playwrights Jonathan Marc Sherman, Neena Beber, Daniel Reitz, Ellen Melaver. In 2008, Eddie created the Red Rope Playhouse in partnership with New York Magazine presenting short plays called, "Ex-Lovers," by Israel Horowitz and his NY Playwrights Lab. Featured at the Off-Broadway Westside Theatre, he co-directed Tony-nominated actors, Jessica Hecht and Marin Ireland, and other acting veterans. Eddie's passion stems from an award-winning career creating advertising campaigns for worldwide brands including IBM, GAP, P&G, Heineken, Pepsi, and he is currently engaged in The Barrow Group Director's Workshop under Seth Barrish.